The Creamy Eye Treatment with Avocado made by Kiehl’s is a thick eyecream suitable for you out there with that dry feeling under the eyes. This creamy eye treatment is marketed for people with all skin types, but the word “creamy” in eye treatment betrays this eyecream. 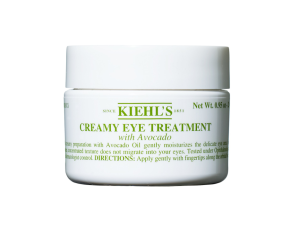 We have tested the Kiehl’s Creamy Eye Treatment with Avocado on 3 women with dry skin. Opening the jar and you’ll immediately notice a pleasant smell. We love the fact that there’s no perfume in this eye cream, because the under eye area is very sensitive. The Persea Gratissima Oil (Avocado) is just perfect for the dry skin. The first time we used this “eye treatment” we didn’t like it that much, because it didn’t absorb very well and made the eye area look quite greasy. Rubbing it in, it turned into a watery-oily texture. But after using it for 4 days this stuff actually worked. 2 out of 3 women noticed a huge improvement around the undereye area. Eye area became hydrated and more important; The fine lines under the eyes were reduced a little bit! By know you probably now that we at bestanti-aging.com are very critical, so what are the downsides? One thing is the jar. Because the undereye area is sensitive and some ingredients (especially anti-oxidants) will not stay stable packed in a jar, it would be better if Kiehl’s used a tube or so. But we can live with this knowing we will run out fast with the 0.5 fl.oz. (14ml). What bothered us the most was that one girl (Jessica) said this cream was irritating and stopped using it after 2 days because her skin under the eyes turned a little red. Last but not least; a message to Kiehl’s; Please market this product “for people with dry skin”, it’s way to greasy for normal and especially oily skin! An eye cream that actually works! Perfect for dry skin, don’t use it if you have oily skin. Just 0.5 fl. oz inside the jar, so you will run out quite fast. Water, Butyrospermum Parkii (Shea Butter), Butylene Glycol, Tridecyl Stearate, Isodecyl Salicylate, PEG-30 Dipolyhydroxystearate, Tridecyl Trimellitate, Persea Gratissima Oil (Avocado), Isocetyl Stearoyl Stearate, Propylene Glycol, Dipentaerythrityl Hexacaprylate/Hexacaprate, Sorbitan Sesquioleate, Magnesium Sulfate, Phenoxyethanol, Hydrogenated Castor Oil, Sodium PCA, Sodium Dehydroacetate, Methylparaben, Ozokerite, Tocopheryl Acetate, Disodium EDTA, Retinyl Palmitate, Copper PCA, Zea Mays Oil (Corn), Beta-Carotene. - Marketed for "all skin types"
This one is perfect for dry skin! Works fine on normal skin, but I prefer a tube, instead of a jar!